To listen to music or voice audio recorded to a Bluetooth ® audio device, switch to the Bluetooth ® audio mode to operate the audio device using the audio system control panel. Any Bluetooth ® audio device must be paired to the vehicle's Bluetooth® unit before it can be used. 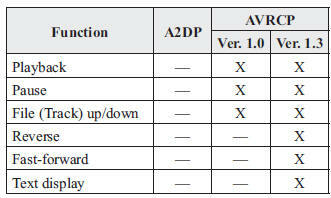 Refer to Bluetooth ® Preparation (Type A/ Type B) on page 5-94 .
is displayed in the audio display. The symbol is not displayed if an un-paired Bluetooth® audio device is being used or the vehicle's Bluetooth ® unit has a malfunction. to switch to the Bluetooth ® audio mode and start playback. If the current device version is lower than AVRCP Ver. 1.3: “ BT Audio ” is displayed. 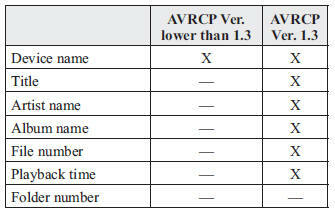 If the current device is AVRCP Ver. 1.3: The playback time is displayed. If the Bluetooth ® audio device does not begin playback, press the Play/ Pause button (4). If a call is received on a hands-free mobile phone during playback from the Bluetooth ® audio device, the playback is stopped. Playback from the Bluetooth ® audio device resumes after the call ends. To stop playback, press the Play/Pause button (4). Press and hold the fast-forward button ( ). Switching the display (only AVRCP Ver. If title information is not available, “ NO TITLE ” is displayed. Only 13 characters can be displayed at one time. To display the rest of the characters of a long title, press and hold the text button (3). The display scrolls the next 13 characters. Press and hold the text button (3) again after the last 13 characters have been displayed to return to the beginning of the title. If a Bluetooth ® audio device is connected, the following information is displayed in the audio display. Some information may not display depending on the device, and if the information cannot be displayed, “ NO TITLE” is indicated.